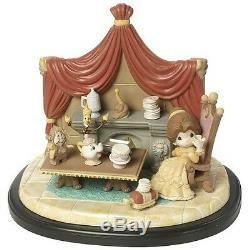 Brand new Precious Moments Disney Beauty and the Beast You're The One I've Been Waiting For Figurine. Limited to only 1,000 pieces worldwide, the 4th edition in the Masterpiece Collection depicts a thoughtful girl dressed as Disneys Belle with her trusted household friends; includes a wooden display base. Simply spellbinding, the generous proportions and intricate detail make this a show-stopping sculpture sure to become the crowning jewel of any collection. Give this impressive Disney Masterpiece Collection sculpture as an unforgettable birthday gift, holiday gift or for romantic holidays to someone who cherishes Belle's story or to anyone with a love for Disney princesses. Meticulously sculpted of fine bisque porcelain and expertly hand-painted, display base is wood. Approximately 12.5H x 14W x 11D inches. New in its original box. The item "Precious Moments Disney Beauty & the Beast You're The One I've Been Waiting For" is in sale since Tuesday, February 28, 2017. This item is in the category "Collectibles\Disneyana\Contemporary (1968-Now)\Figurines\Other Contemp Disney Figurines". The seller is "bpzgap" and is located in Nashville, Tennessee. This item can be shipped worldwide.